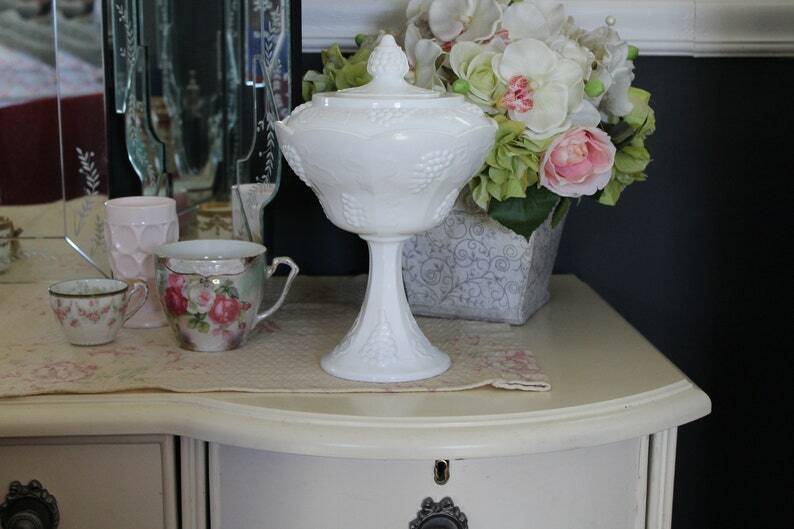 This vintage milk glass compote or covered candy dish was made by Indiana Glass sometime around the 1960s. It is from the Colony Harvest line. There are raised grapes, grape leaves and a grape cluster knob on the lid. This Colony Harvest pedestal dish would look pretty on a shelf with other white glass for a monochromatic look in your farmhouse kitchen. It would look pretty in a nursery, little girl's room, in the powder room filled with cotton balls or soaps, or as a centerpiece at a bridal shower or wedding. It is in great vintage condition. Though it looks like it's never been used, there is a tiny nick on the rim -- view the last photo about 10:00 p.m. There are some manufacturing flaws -- striations -- please view the 5th photo. It's big. About 10 1/2" to the top of the knob and 6 3/4" in diameter.